Living in a city will do funny things to people. As it turns out, I'm not a special flower. Everyone and their mother wants to GTFO of NYC, especially in the summer (AKA: the season of hot garbage, omnipresent scent of urine, and mysterious drops of liquid on your head -- was that an AC unit? Pee? Spit?). While I'm still not into the whole sleeping-outside-surrounded-by-nature thing, I have grown fond of hiking. 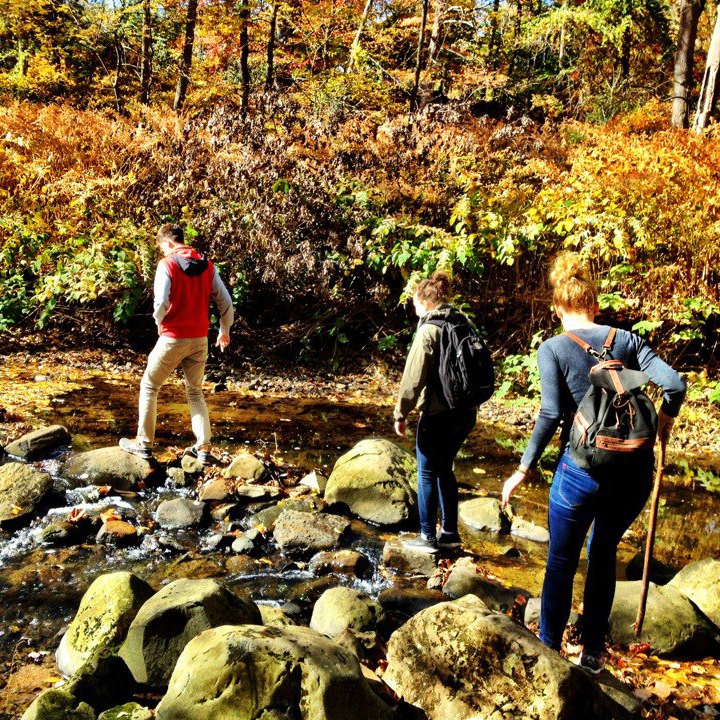 Most people don't realize that New York City is close to awesome hiking trails in upstate and New Jersey. Those people are dumb. New York state is huge, y'all! Luckily for most New Yorkers without a car (like myself), a lot of these trails are accessible by train & bus. West Point is somewhere behind us. An easy 7-mile loop around the Hudson Valley passing by old estates and a great view of the U.S. Military Academy at West Point. Bonus: Garrison is a cute, artsy town so leave time to check it out before heading back on the train. How to get there: $26.50 R/T on Metro-North Hudson line to Garrison station. A trail on the southern end of the parking lot will lead to the trailhead. If you squint really hard, you can see NYC. The woods are big. Who knew? This moderate circuit trail in New Jersey features waterfalls and a seriously impressive panoramic view of NYC. It also features a bit of history. Pillars mark a Revolutionary War battle that took place here and where George Washington surveyed the countryside. Art! Nature! This place has it all. While not technically a hiking trip, there are sweeping views and a lot of walking involved so I'm including it. 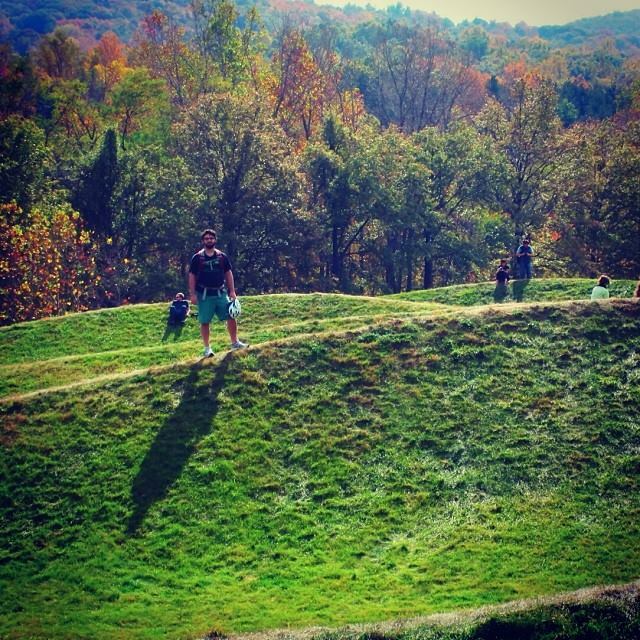 It's essentially an open-air museum that contains what is perhaps the largest collection of contemporary outdoor sculpture in the United States including Serra, Goldsworthy, Maya Lin, Lichtenstein, and Oldenburg among so many others. Get there early to rent a bike to ride around the vast grounds. For some dumb reason they only have 20 available. 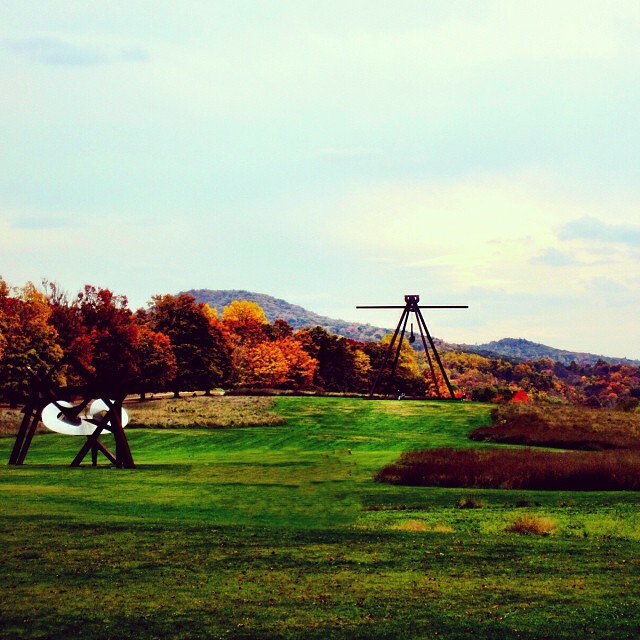 How to get there: for $55 R/T Coach USA provides bus service from Port Authority to Storm King. This used to be a direct trip, but now they've included Woodbury Common Outlets on the ride. Note to Coach: I do not want to go shopping after walking for 5 hours. Not my picture -- I'm way to scared to climb this thing. The mountain is called BREAK NECK you guys. A lot of people hike this trail because its so easy to get to and has amazing views of the Hudson River. Be warned -- this trail isn't for beginners. It starts with a 720 vertical scramble up the mountain. The famous trail that stretches from Georgia to Maine goes through New York and connects to other great trails in upstate. If you're not like me and do feel like camping, this is the place to do it. If these suggestions aren't good enough for you (and why the hell aren't they?!) you can now take the Trail Taxi to just about anywhere for $25-$60.